Abby the Librarian: Give Me a Break! Last week, I added to a great conversation started by Julie Jurgens in the Storytime Underground Facebook Group (if you are not following Storytime Underground, I must insist that you do so immediately!) about storytime scheduling. 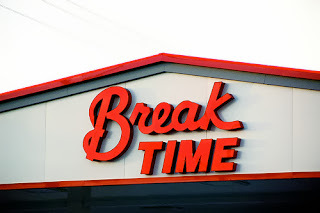 When, if ever, do you take a break? While I know that our families love storytime, we take several long breaks throughout the year. Typically, our winter/spring session starts mid-January and goes through mid-April. We take 5-6 weeks off during April and May to prep for Summer Reading Club and to allow for school visits to promote the SRC and connect with our school-age kids. We'll have 7 or 8 weeks of storytime over the summer and then take August off. Fall session runs from the week of Labor Day through mid-December and then we take a 4-5 week break over the holidays and beginning of January. All of our storytimes are currently drop-in because attendance was going way, way down for registered sessions of storytime. We offer baby storytime and toddler time (2's and 3's) twice a week each and we offer Preschool Explorers and Reading Rock Stars (beginning readers, ages 4-6) once a week each. Starting this month we'll also be offering a monthly bi-lingual storytime in the evening and hopefully at some point a regular evening storytime. In addition to this, we often have several group visits and outreach visits each week. Yes, I have a staff and we spread out the workload so that everyone typically ends up doing 2-3 programs a week. But I cannot fathom doing all that we do without breaks here and there. Storytimes tend to break up the day, making it difficult to work on a large, involved project. Having to schedule staff meetings, staff training, employee evaluations, committee meetings, outreach visits, etc. gets really tricky when you're working around the storytime schedules. I truly can't imagine being able to schedule visits to our 13+ elementary schools while having to work around a storytime schedule. With state testing, field trips, and specials, the schools have enough conflicts to work around! If we didn't have a completely open schedule, we would not be able to make it to most of the schools. Librarians are professionals and we need time to participate in professional development, to attend conferences, workshops, and webinars. This year, we'll also be taking a one-week break in March while the PLA Conference is being held in Indianapolis because my director wants to send as many staff as possible. And all that on top of serving patrons at our reference desk. Even if we weren't doing all that other stuff, I can see a benefit in taking planning breaks. It sends a message that planning a quality storytime requires thoughtful work. We value our children enough to ensure that programs are age-appropriate and contain activities that will develop school readiness skills. We're doing our research so we can pass that on to the patrons. Although we know our patrons will miss us, we explain to them that we're taking time to plan the next round of fun and learning. And they understand! You wouldn't expect an academic librarian to put together a semester's worth of classes with no planning time, would you? I have no doubt that there are superhero librarians doing storytime every week year-round. If that's what works for you and for your community, more power to you. But I ask you to ask yourself if that's really working for you and your community. Does it give you the chance to learn and try new things? Does it allow you to do work on work time or are you taking it home and doing it on personal time*? Does it result in storytimes that are rooted in early literacy and child development research? Does it give you a chance to recharge occasionally and keep from getting burned out? I am lucky to have a super supportive administration who trust my judgment in storytime and program planning. I am lucky to have a super staff who take on everything that I throw at them. And I will always fight for my staff to have the programming breaks they need to give them time to plan, to develop their skills, to recharge, and to keep loving what they are doing! * Yup, children's librarianship is a passion and I have definitely done work at home when I'm feeling inspired or come across some great resource. But this should be the exception, not the rule!